Revel in breathtaking sunsets and stunning views from this Sag Harbor Cove condo. The Waterfront Delight offers the best of both worlds: peaceful seclusion and close proximity to the shops, dining and entertainment of Sag Harbor. The condo s minimalist modern d cor exudes freshness and relaxation. There is beautiful hardwood flooring throughout the main floor. 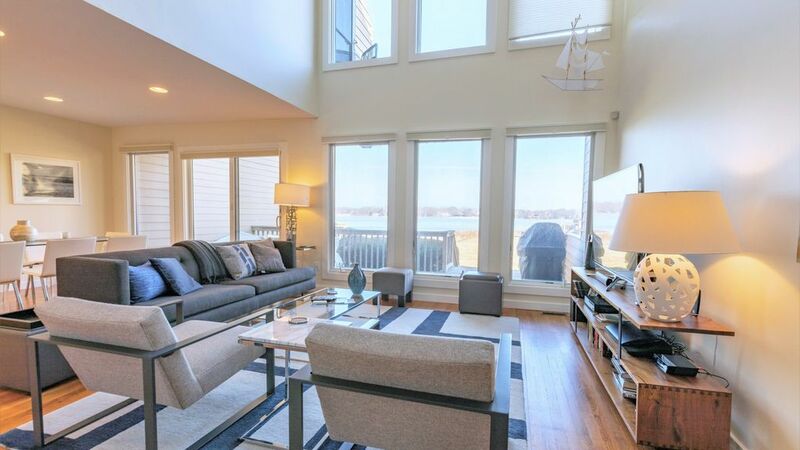 The duplex condo features a double height living room with a window wall that looks out onto the cove and fills the space with natural light. Relax and enjoy your favorite television show or movie on the living room's large cable television and comfortable couch. The spacious fully-equipped kitchen has granite countertops, white custom cabinetry and a granite-topped island with seating for two. The comfortable dining area evokes a crisp seaside escape with a glass dining table that seats eight and quintessential beach art. A sliding glass door opens to a finished wood deck, where you can barbecue while enjoying the fresh air and water views. A bonus loft area upstairs offers a quiet space for morning reflection. With three bedrooms and two full baths, the 1,750 sq. ft. condo comfortably sleeps six people. Well appointed furnishings and cozy bedding ensure a good night s sleep. Part of the Sag Harbor Villas community, visitors enjoy access to the heated communal pool and two tennis courts. Haven Beach is a 10-minute drive if you are planning a beach day. Payment/Refund Policy: All payments are non-refundable. If you must cancel your reservation, we will re-list availability, and in the event we are able to re-book the nights you originally booked, a refund may be processed. We strongly encourage you to purchase travelers insurance (which we offer) as a means of payment protection. The condo was impeccable, clean, and beautifully furnished, the views of the water from the back yard are serene, and you can't beat the short walk into town. The owners are great, very friendly and extremely accommodating. I would go back in a minute.